A bit of a pride and joy, I started these heirloom beauties from seeds in my basement last winter. One might have described them as scrawny when I planted them outside once threat of frost had passed. Gently I tended to them with shade cloth and tomato fertilizer. Soon the shade cloth frame was replaced for a taller one, then to be removed so as to not hasten their expansion and make sure the pollinators could do their job in and around the plants. After a 10 year sabbatical, I reintroduced tomatoes to my food life last year. Since I was a kid tomatoes made my tummy hurt. In my family the answer for that was to put a little sugar on them. Not eating Grandma’s farm grown tomatoes wasn’t an option. Throughout adulthood I didn’t really notice tomatoes making my tummy hurt. I probably ate more tomatoes because tomatoes are ‘healthy’. Sometimes, with functional restoration, food sensitivities can be overcome. I did it for myself and now I guide others. When a Functional Doctor suggested to me the tomatoes I was eating could be a source of inner inflammation expressing itself outward, I gave them up. Instantly my symptoms subsided. I found pesto instead of tomato sauce on pizza downright wonderful. I learned to make NoMato sauce from beets, carrots, onions, red miso and other balanced savory with sweet real food ingredients. Leaving bothersome food out of your food life can be easy. I’ve personally done it with eggs, gluten and tomatoes. And like most Americans I learned that so much food I ate contained hidden sugar which required re-learning my choices. Now that I’ve healed my tummy and auto-immunity is under wraps, I’ve been able to reintroduce good gluten and eggs to my amazement and delight. So why not tomatoes I thought?! Reintroduce them I did! I began by buying an organic heirloom tomato now and again last summer. Without repercussions, this year I chose heirloom seeds and mostly yellow varieties which are said to be the mildest. I came to love the Green Zebra and Asian Bumble varieties. With the cool weather getting cooler, it was time to bring these kids in ready or not. I gave a huge bag (more than I brought in my kitchen) to my neighbor. I might have thought ahead to a canning project, but maybe next year. For now I am taking tomatoes as gifts most everywhere I go! 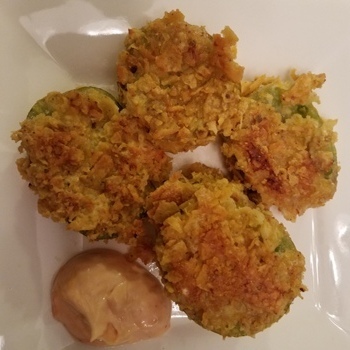 Still with many on the plate, I decided to see what the fuss has been about with ‘Fried Green Tomatoes’… somewhat folklore about the south brought about by the movie. Put flour, egg and corn chips in separate bowls. Add adobo chile powder, a sprinkle of salt and twist or two of freshly ground pepper to flour and stir with fork or whisk to distribute. Heat large cast iron skillet or griddle to high heat. Add 2 Tbsp avocado oil to skillet or griddle. Dip tomato slice in flour, egg and coat both sides with corn chips. Place on skillet/griddle. Repeat. Lightly spray top of tomato with avocado oil. 3 - 5 minutes later when they bottom is golden brown, flip it. Repeat. While tomatoes are sizzling up; combine the sour cream, yogurt, siracha and garlic. Serve piping hot as an appetizer or side dish! Note about Food Sensitivities: They are no laughing matter! If you suffer from known food sensitivities by all means avoid those foods entirely. When you suspect foods to be causing you internal disruption, Chapter 9 of A Fresh Wellness Mindset is dedicated to ‘Lose Annoying Food & Restore Yourself’. “Figuring out how to support optimal function with food and feel great isn’t always too complex. Much of the time, great advancements can be reaped in how we experience wellness by engaging simplicity, mindfulness, real food and nurturing lifestyle practice.” (John, 2018). The book offers a simple test you can take at home to measure your body’s response to suspect foods. I am equipped to work with you 1:1 to support you through your journey to navigate food sensitivities and make truly healthful choices. I offer a 15 minute complimentary conversation to hear your wellness goals, challenges/where you feel stuck and you can find out if my approach is a fit for you. Schedule the call here. John, T., A Fresh Wellness Mindset: Personalize Your Food Life and Find Your Truth about Gluten. CreateSpace Independent Publishing Platform. North Charleston, SC. Uplift Your Food Life By Replacing Myths About Eating Healthfully And How To Navigate Choices. Healthful Yet Good Is Tricky Until You Know How To Do It Wisely. Work With Tam For A Plan You And Your Being Love!